University of the Philippines (UP) have been experiencing infrastructure boom since 2010. Projects being undertaken in the university includes renovation and rehabilitation of existing buildings, construction of new buildings, among others. With the upsurge in the government funding for the university capital outlay, managing the increasing number of construction projects have become more challenging. Confronted with challenges concerning the capacity of its personnel, in terms of managing construction projects’ processes, bureaucratic nature of public institutions and lack of IT integration to its processes, as of 2016, it has been documented that almost 70% of the university projects procured through GAA 2011-2015 were not yet complete. One of the many university projects that experienced delay was the UP Quezon Hall Project which was procured through GAA 2013. This project involves the renovation of the university’s main administration building that was planned to be completed within a year. The construction started in early 2014 but was finished beyond the schedule as per the contract. 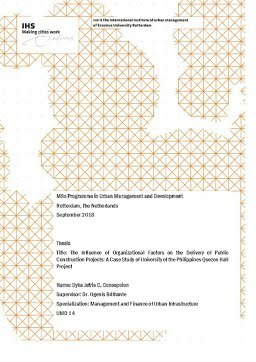 This study aims to explain how organizational factors, people, process, and technology, influenced the delay of UP Quezon Hall Project. The delays in university construction projects impact the university, as project owners, in many ways such as disturbing the university’s overall development plan, delayed benefits of projects that are still in the pipeline, etc., This study is important as it will show how organizational factors influence the delivery of construction projects in the public sector. Using several theories as guide for analysis which includes, HRM, bureaucracy theory, and RBV, an in-depth analysis was performed in order to understand how and why the completion of UP Quezon Hall Project was delayed. This research is a qualitative case study that utilized semi-structured interview as the main source of primary data. Respondents belong from both the owner and the contractor side. Secondary data was also used to substantiate the main findings. The main limitations encountered involves the sample size as some of the expected respondents were not able to participate due to considerations in schedule while some decline to take part. The data collected from the interview were analysed by clustering them into similar idea. Afterwards, data were presented using frequency tables. Based on the results obtained, it was found that for peoplerelated factors, inadequate number of staff to manage the construction project, lack of training and development, and hiring process negatively affected the delivery of the project. For process-related factors, the lack of project operations manual, inefficiencies in the procurement and (bureaucratic) process of making design decisions negatively affected the project’s timely delivery. In terms of technology-related factors, the lack of relevant database and low level of IT were found to negatively affect the schedule of the project. Apart from organizational factors, other factors which includes failure of the university to provide right-of-way on schedule, absence of independent/in-house project manager, and lack of capacity of BAC in implementing the procurement law also negatively affected the schedule of the project. From these findings, the project was delayed due to combinations of various factors. To conclude, it was found that people, process, technology related, and other factors significantly influenced the delay of UP Quezon Hall Project. Collectively, the three elements The Influence of Organizational Factors on the Delivery of Public Construction Projects: A Case Study of University of the Philippines Quezon Hall Project iv of organizational factors plus other factors do not have an equal share of magnitude as each factor influences the others. As the main resource necessary to achieving a successful project, people are responsible for streamlining the process and managing the existing technology for the benefit of the project. A good process and adequate technology will further enhance the quality of human resource by increasing their efficiency and productivity for a successful project delivery. The study therefore recommends that the university, as project owner, address the factors identified in this study. Moreover, a balanced attention among the people, process, and technology within the university can enhance their project delivery performance.